San Antonio Spurs point guard Tony Parker is playing as good of basketball, at the present time, as any backcourt player in the NBA playoffs. Averaging 19.1 points and 7.1 assists per game versus the Utah Jazz and Los Angeles Clippers, Parker has been the driving force behind a Spurs team that has won 18 consecutive games (including regular and postseason), heading into their Western Conference Finals matchup with the Oklahoma City Thunder. All eyes will be on Parker's one-on-one battle with OKC point guard Russell Westbrook during the upcoming series. The winner of that squabble may well serve as the key factor in this highly anticipated clash of Western powers. Already in his 11th NBA season, the French product's regular season output included a scoring average of 18.3 points and a career high of 7.7 assists per game. To say the least, the 30-year-old has been nothing short of spectacular. Parker's quest for a fourth NBA championship brought him and the Spurs to Los Angeles last weekend, for what turned out to be a very brief two-game closeout of the Clippers at Staples Center. 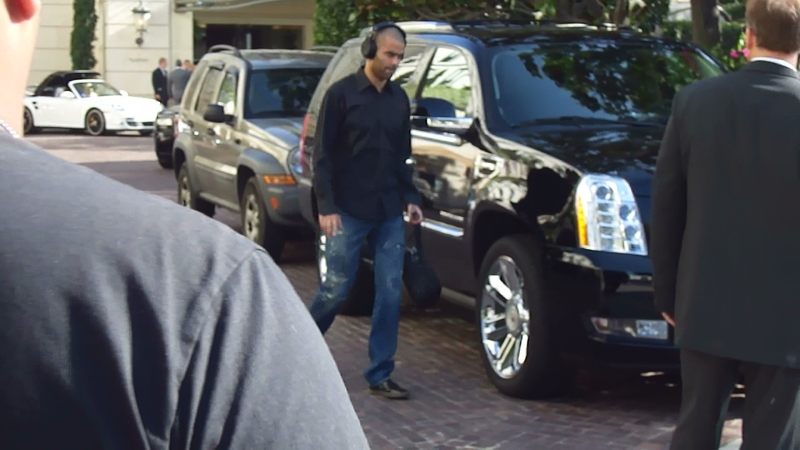 Per the above iFolloSports.com original photos, Parker was seen leaving the Peninsula Hotel Beverly Hills, as San Antonio boarded their charter bus for the drive to the downtown LA arena, located 11 miles east of the luxury property. While Parker was all business on this day, iFolloSports.com was also on hand to capture some of his previous interactions with fans. Here is a clip of Parker signing autographs at the 2011 NBA Jam Session, as well as a piece of video showcasing Parker's time with autograph seeking fans outside of the Spurs Minneapolis hotel last season.